M.O.B. – Dirty wet dog , boats and sailing. Most of the time i am going to be writing about the greater enjoment and smaller pain that we have with our little craft, once in a while i am going to feature some bigger boats just because its my blog and i like those boats : today however i am going to talk about serious stuff and recount an actual near-miss of my own this year. In this post then i am not talking about mainly old blokes, nor even moany old blokes but man-overboard : i don’t know if you have read any other posts but a while back i posted about Lorient and the home of the Eric Tabarly museum….possibly the greatest ever small boat sailor and yes, he died in our very own Irish sea after going overboard from his Pen Duick 1. So it happens to the best of us. My own experience this year was in coming so close to going overboard from WABI”’ in a less serious setting but equally doing so while on my own. let me tell you how that came about. 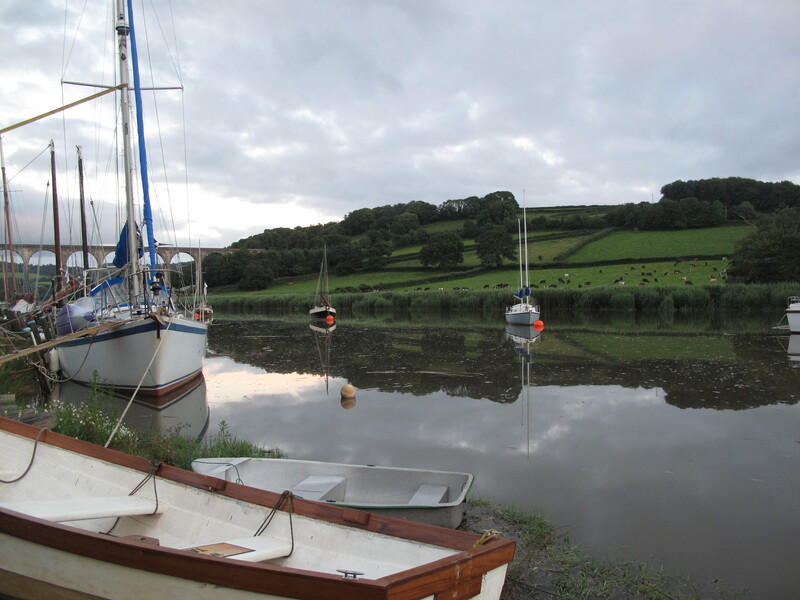 I was returning from a cruise downriver and a night out at dandy hole, i had beat up the Lynher mostly on one tack and that short tacked my way under the Tamar bridge and then into the Tamar proper after warren point. The wind in the river was both gusty and shifty with huge wind shifts : any river-sailor will now how that goes. So : i had a beat upriver but with the flood and with the added problem of having to beat through the almost continous moorings that stretch up to weir quay. If anything the wind was gusting up harder and i was having to work harder, when i got things wrong occasionally the boat was overpowered so in the short gap between mooring zones i just decided to slap a reef in before the next section. Simple enough : sheet the mizzen in , de-power the main, ease halyad and go forward to heave down the tack and haul out the clew….i have a cleat at the goosneck for the clew reef pennant. All should have been done quickly but several things were a bit snarly and i had to move back and forth to the cockpit a couple of times, in doing so i hadn’t realised how close to a shallow bank i was and suddenly the boat grounded, slew around on the board and with tide and wind lay over a bit with me on the lee side. At the time i was working on and holding the boom which, because it was unsheeted, then swung out to the lee with me hanging on it and my feet caught behind the guardrail. i seriously thought that not only was i going for a swim but that to do so might have been he best way out of the problem ie drop-in , hand myself around to the stern and climb back in over the stern ladder. Somehow i made the best rock climbers move ever and got back inboard over the rail and continued the job. So no harm came of it, just a few moments excitment. I thought though how different that might have been in rough and cold water and resolved to change things so that i can do critical things like sail handling all from the cockpit : that is one ongoing project and another is to make my stern-deployed bow anchor as well so that i can not only have that weight aft but also work from the bigger safer cockpit. The second side to this is that i resolved to once again familiarise myself with being in and swimming in cold water and recall how to do self rescues : not so long ago i was actively a canoeist and sea-kayaker and while i can’t do an eskimo roll i can get out of the boat and work out some method of self rescue and a large part of that is just about being confident in cold moving water and having a positive means and plan for getting out of that water. I note that with the Frances it was fully viable to climb aboard via the bobstay and with the liberty it doesn’t seem difficult to deploy the ladder and get back in the boat.